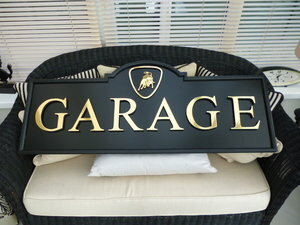 Hand Made Lamborghini 3D Garage Sign. Measuring 1000mm x 400mm. All Wood Construction Other Than The Bull. Gold Letters On Black Background. Shipping Extra. Also Available With Chrome Letters And Chrome Bull On Black Background. rare hardback story of the modern icon. 127 pages of specs and colour photos by chris bennett. super condition and with no damage. price exc postage. more memorabilia on our website. simply stunning as brand new never used or worn lamborghini watch. comes with large carbon fibre look presentation box. brought from the states a few years ago and was just put in a cupboard.still has protective film on.